Gibson Movers are a family owned, fully licensed, fully insured, Better Business Bureau listed business with a AAA rating. 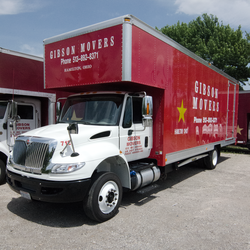 Gibson movers was established in 1936 in Hamilton, Ohio. We have been in operation for over 75 years and counting. We are a full service moving company and offer both local and long distance moving services. We treat your belongings like our own and take pride in our company so that you will recommend us to your family and friends. Moving can be a stressful time, let us help you move forward. Gibson Movers will pack and relocate your existing commercial and residential properties. Take the stress of your big move with the help of Gibson Movers. Pool tables must be taken apart by the owner prior to the arrival of Gibson Movers. Gibson Movers will not hook up equipment such as washing machines and more.